Everyone has favorite locations. One of mine is Lombard Canyon. 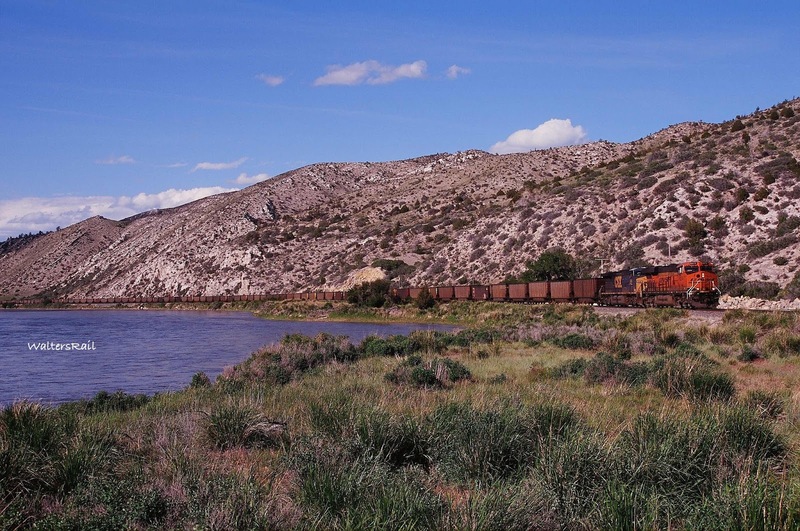 A major railroad portal, the canyon's history is unique, its geology spectacular. If you have ever heard a geologist talk about "uplift," Lombard Canyon is the place to see it displayed. Also, much of the land around the canyon is public, thanks to the Bureau of Reclamation, so one can hike for hours without being arrested or shot at. The irrigation project in the middle of the canyon is typical of early and mid-20th century America, but the federal government has been out of the dam construction business for a long time. So climb aboard and follow me on a modest tour of one of North America's most interesting landmarks. 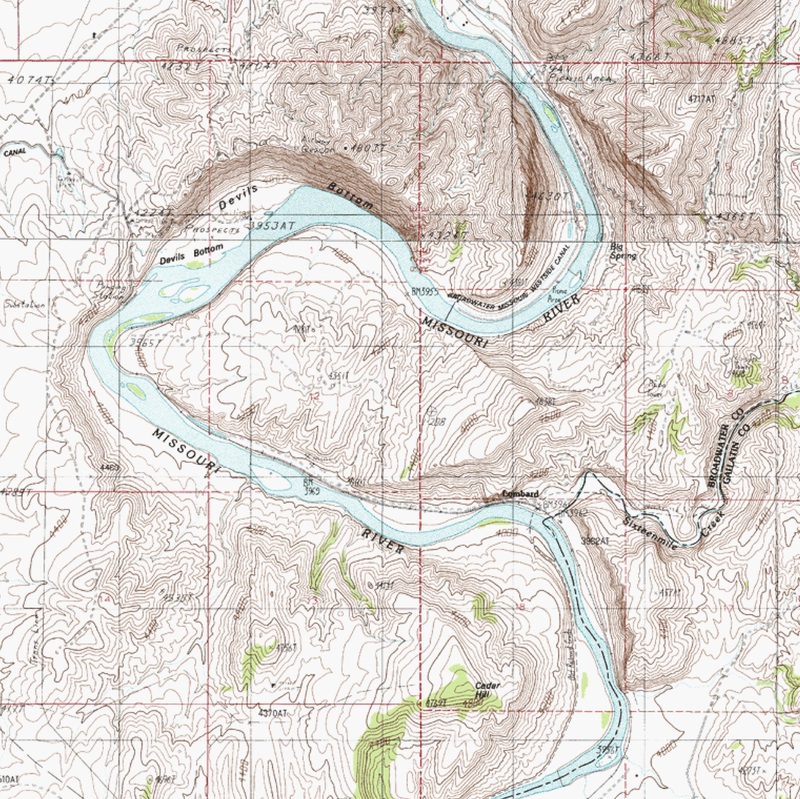 Above is the U.S. Geological Survey map of the canyon. 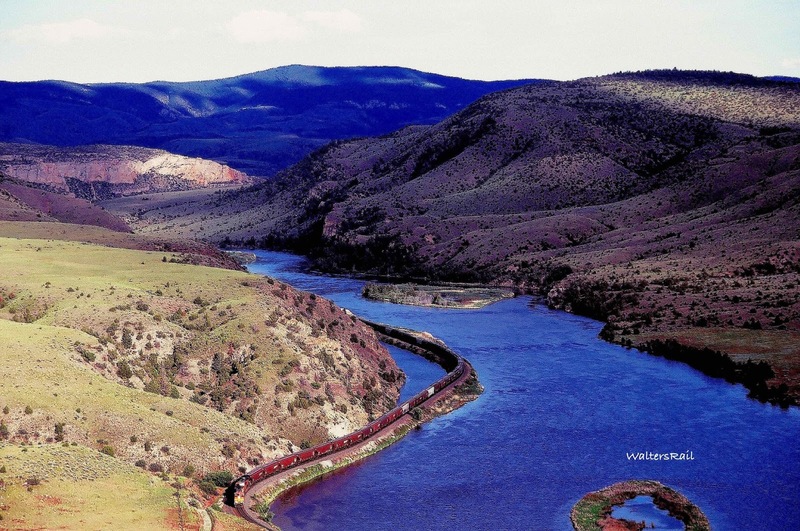 You can see the Montana Rail Link line running on the east side of the Missouri River in the top of the map. 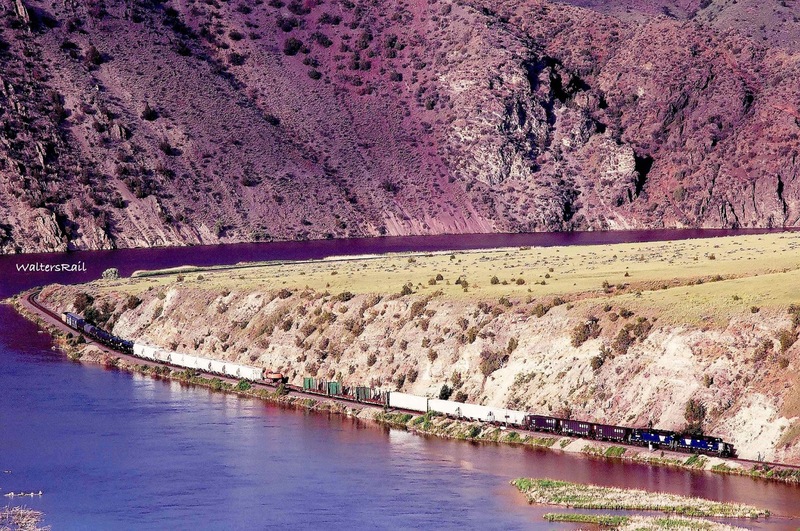 The line follows the river closely through the canyon. In the first bend in the river, notice the label " Broadwater-Missouri Westside Canal." Immediately below the word "Broadwater," you see a line across the river. This is the Broadwater-Missouri low water dam. A small lake is created behind the dam. Water from the lake runs by gravity through the "westside" canal, though at this point the canal is north of the river. 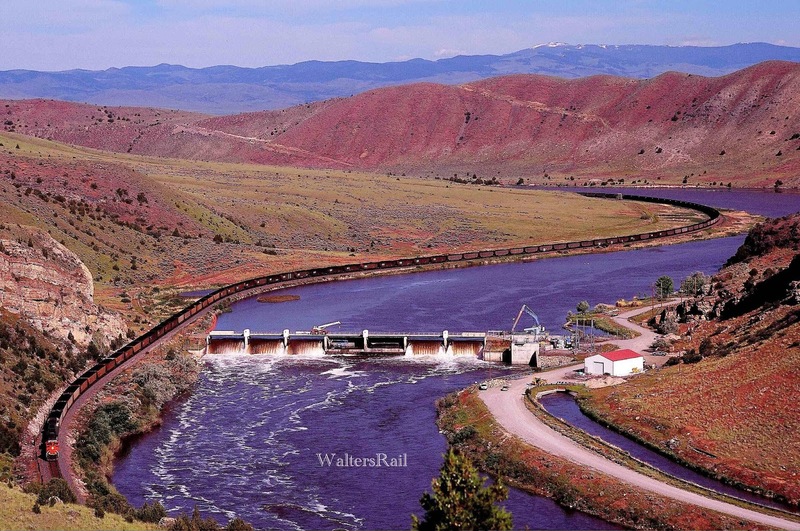 Then the river and canal both turn north and run to a point where the canal splits, part still running west of the river, the other part actually crossing the river in a large pipe, then running in an open canal on the east side of the river to fields where water is pumped for irrigation. Even more amazing is what happens west of the low water dam, where water is pumped through a tunnel up the canyon wall and deposited in irrigation canals at the top. On the map above, look immediately to the left of the low water dam to the smaller notation for "Devil's Bottom," and left of that notation you will see in handwriting "Pumping Station." 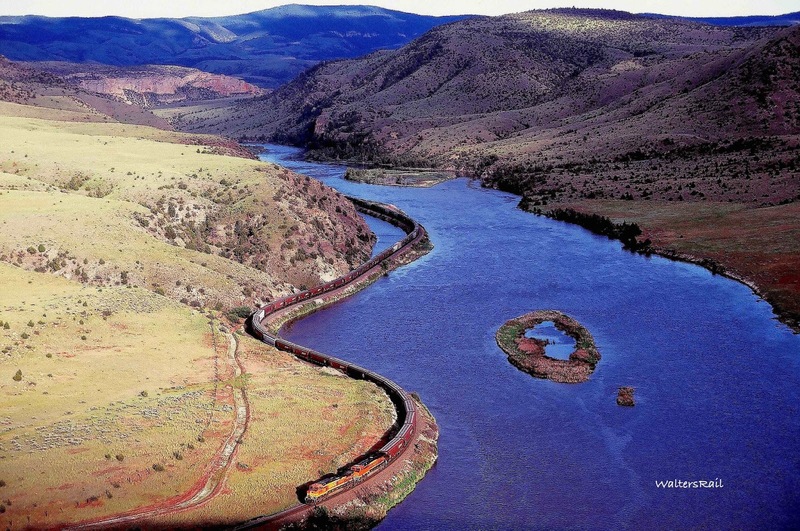 Above the station is shown the tunnel, horseshoe-shaped to minimize the gradient, and at the top is shown where the tunnel delivers water to the canal. 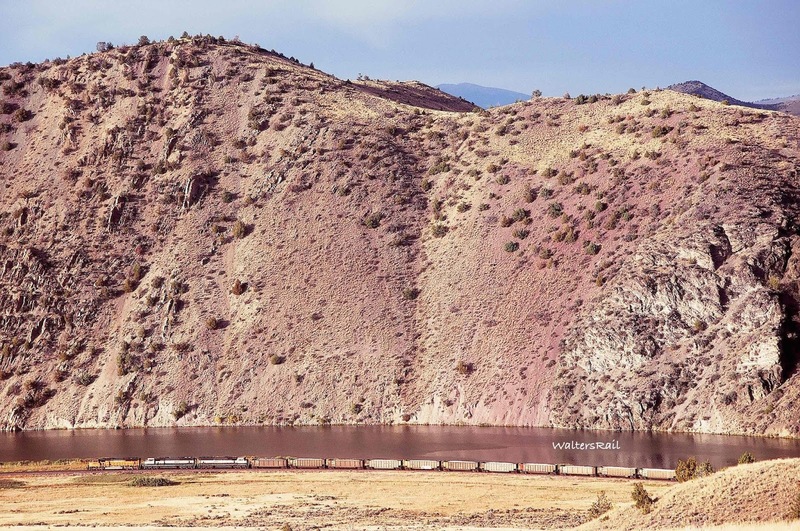 In the left of this image, you can see a dirt road running diagonally down the face of the cliff, leading to the pumping station. To the right of the road you can see the scar (still visible after all these years) when the tunnel makes a U-turn and bores up the side of the cliff to the top of the grade where water runs into the canal and then is carried by gravity downgrade to waiting fields. 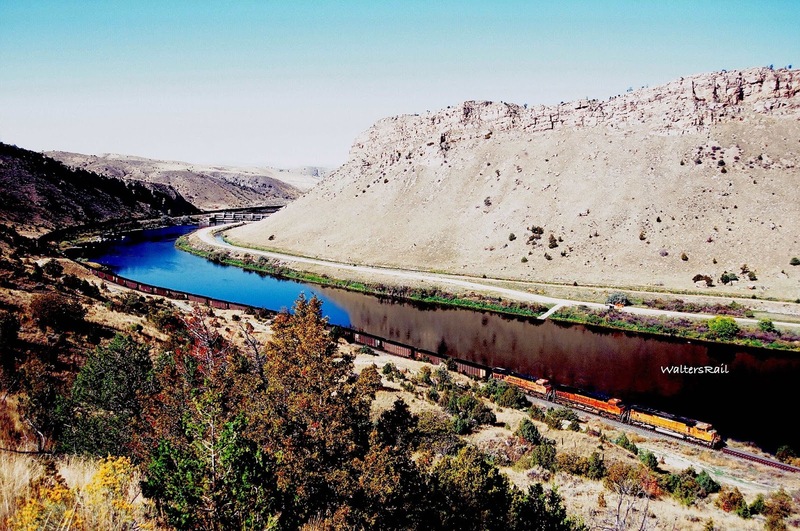 This irrigation project to pump water up the canyon cliff, called the Pick-Sloan Missouri Basin Program, was requested by Broadwater County, Montana, to irrigate land equal in size to that inundated by Canyon Ferry Lake to the north. 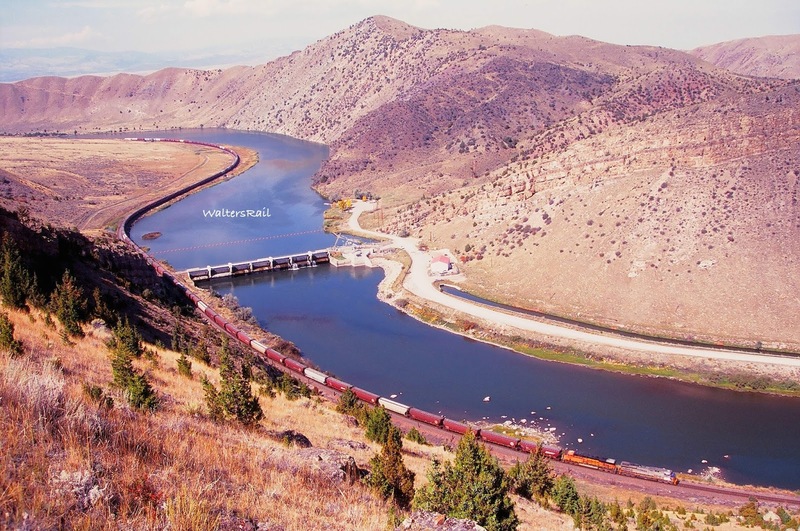 Construction was authorized by the Federal Flood Control Act of 1946, began in 1952 in tandem with Canyon Ferry Lake and was completed in 1954. 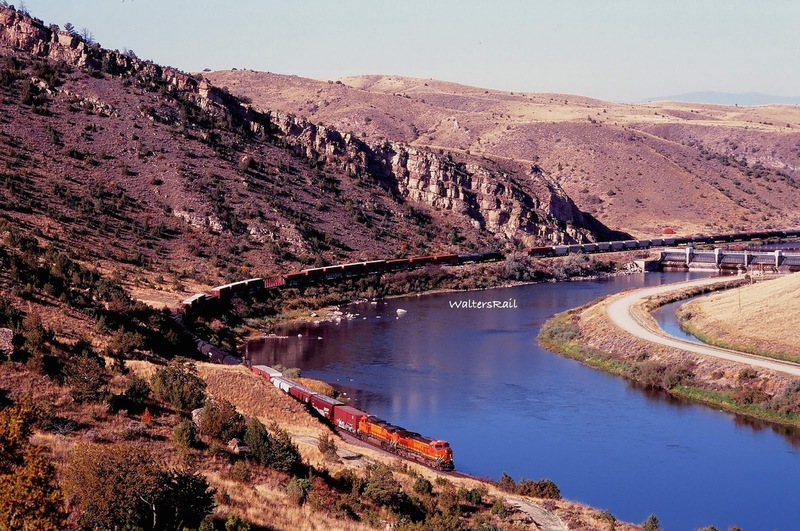 The Bureau of Reclamation built both Canyon Lake and the Lombard Canyon irrigation project. 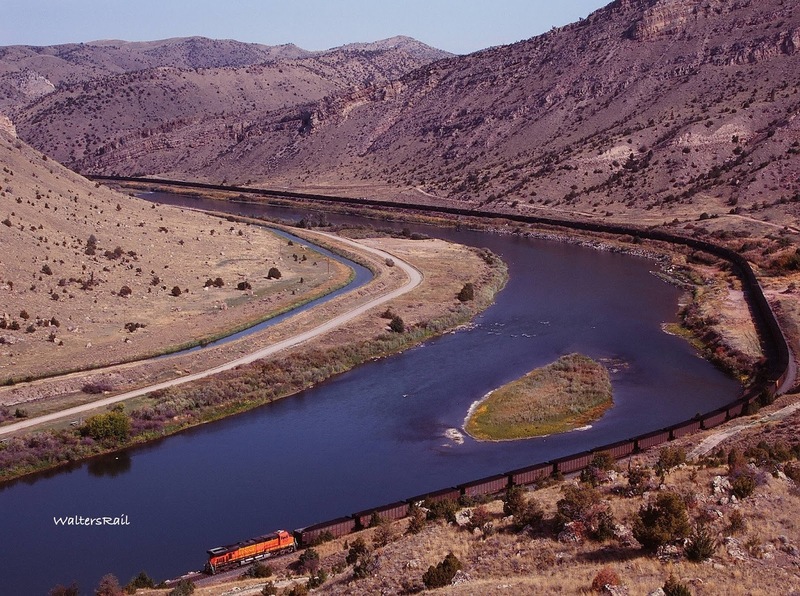 In writing this post, I learned quite a bit about this federal agency, which was created in 1902 as the U.S. Reclamation Service to study potential water development projects on federal lands in the western U.S. In 1928, Congress authorized the Boulder Dam Project, which marked the beginning of the major construction period for the Bureau. 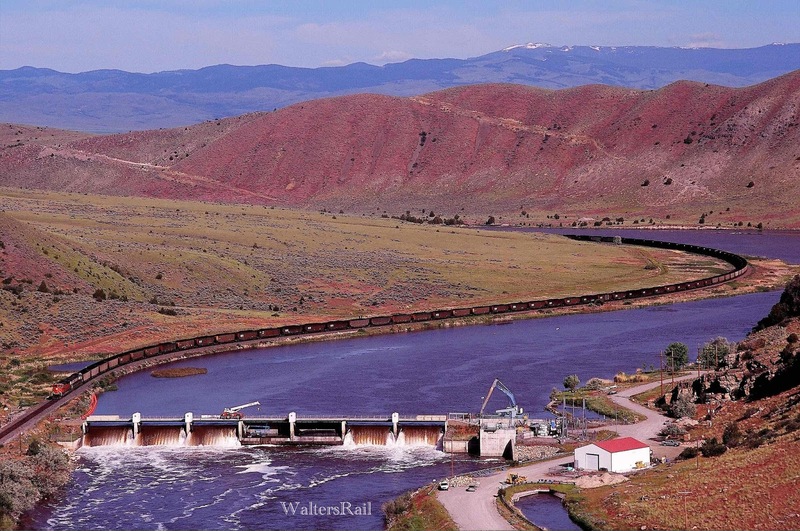 Through the 1930's, 40's and 50's, the United States went on what might be called a "dam(n) building frenzy," with reservoir, power and irrigation projects created all across the West. My home state of Oklahoma is covered, especially the eastern half, with reservoirs constructed then -- some of which were constructed by the Bureau, others by the Army Corps of Engineers, and others by federal agencies that I don't know the names of. In the 1960's, opposition developed to major water projects such as the proposed Bridge Canyon Dam which would have been built at the uppermost limit of Lake Mead (created by Boulder Dam). The resulting reservoir would have stretched over 90 miles, including 13 miles contiguous with Grand Canyon National Park. The Bureau eventually dropped the plan after fierce opposition. 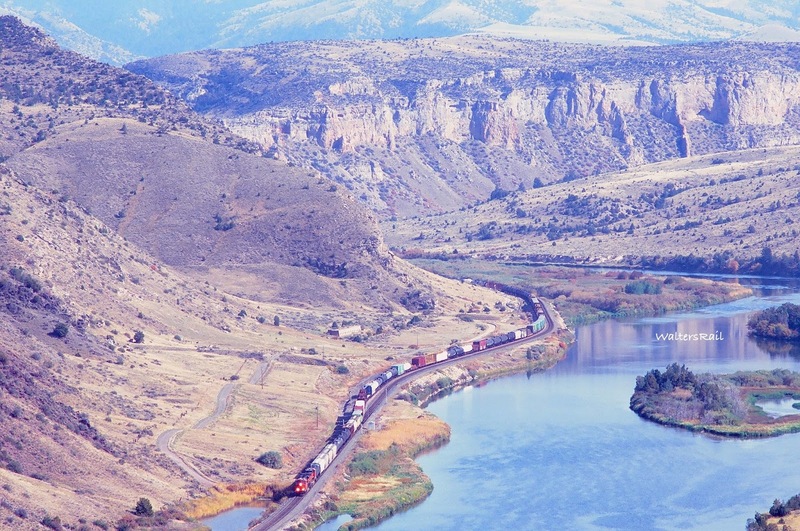 The last major authorization for Bureau projects occurred in the late 1960's. 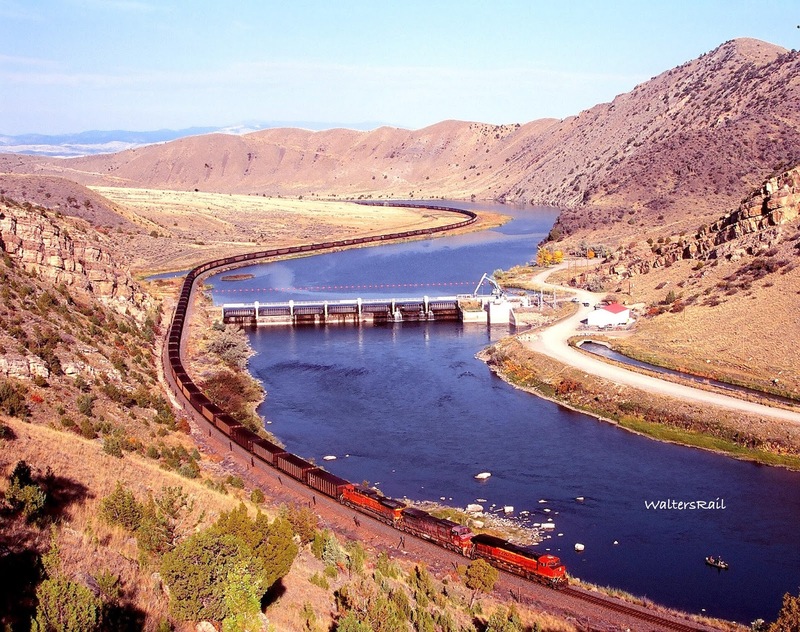 The 1976 failure of Teton Dam (as the reservoir filled) was more or less the "last nail in the coffin." 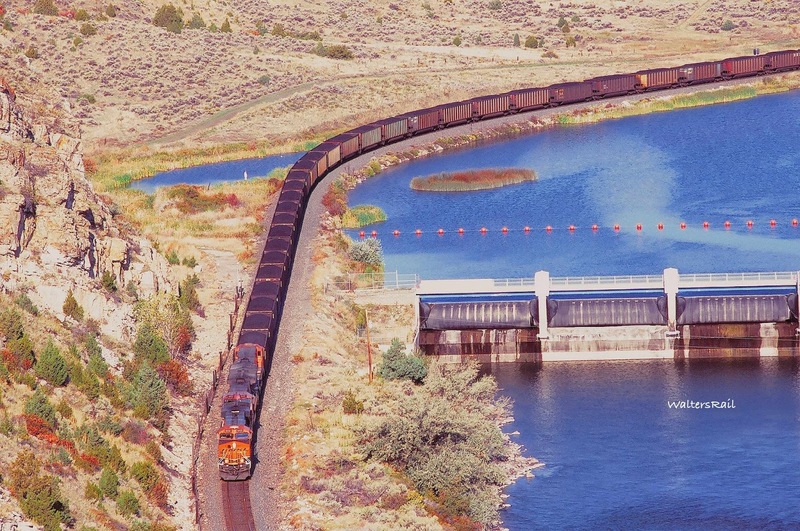 Today the Bureau of Reclamation maintains the projects built years ago, operating approximately 180 projects in 17 western states. It still has a major presence in the West, but its overall federal influence is greatly diminished. The irrigation project is located and the images above were taken in the east end of the canyon, which can be approached on a public road running south out of Toston. Near town, the road is hard surfaced, then turns to gravel. As it enters the canyon, the road turns to dirt and native rock, then climbs the canyon wall in a series of switch backs. It is shown on the map above by dotted lines - indicating "minimum maintenance." A high clearance vehicle -- pick-up or Jeep -- is advisable to avoid the many large rocks in the road, but if you make it to the top, the view is spectacular. Power lines at the top of the grade interfere with the view, but the land is not fenced. I believe it is public, and one can hike hither and yon in an attempt to remove utility poles and wires from the photographs. The image immediately below shows my own effort. This image also demonstrates wonderfully the concept of "uplift," and no, I'm not talking about women's undergarments. In geology, uplift refers to the tilting upward of the earth's surface. "Orogeny" refers to the concentrated and severe uplift associated with mountain building. When two tectonic plates slide against each other, one goes down and the other goes up. The one going up pushes the ground at an angle. The pushing usually amounts to an inch or so per year and so is not generally noticeable. But over the eons, the uplift can be substantial. In the image above, notice how the limestone in the background angles up from the river at a 35-40 degree angle. A long, long time ago (in a galaxy far, far away), that was the flat bottom of an inland sea. In 1916, the geologist W.P. 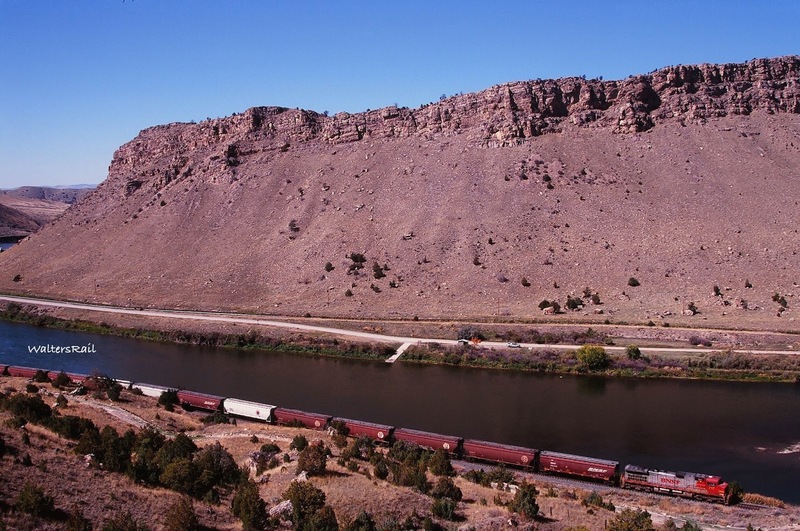 Haynes proposed the name "Lombard Overthrust" for this formation "because it is well exposed in the canyon of the Missouri River near Lombard. Here the fault plane dips about 40 degrees to the west." If you would like to read the entire paper, see www.jstor.org/stable/30079361. 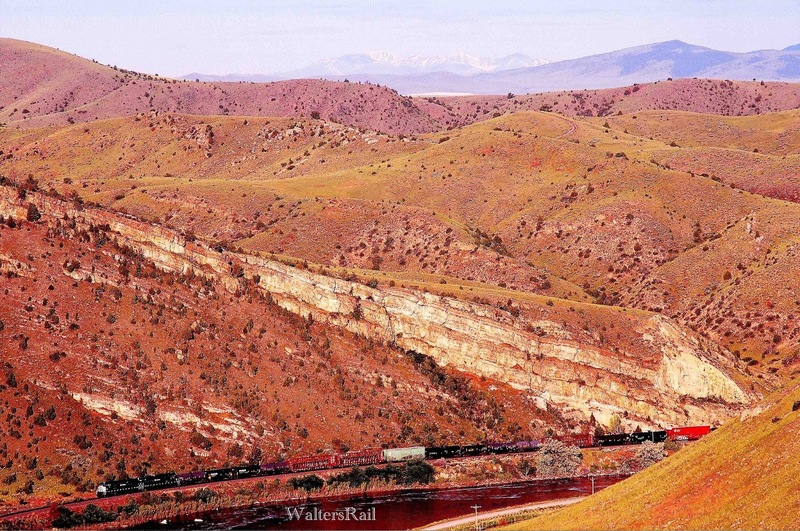 Many other images in this post also demonstrate the uplift that created Lombard Canyon over the ages. 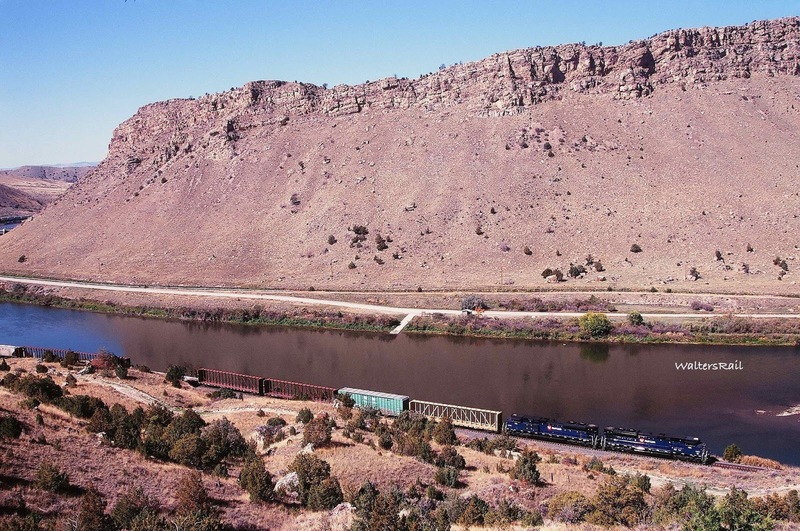 Beyond the low water dam and pump station lies the west end of the canyon, where the river makes a horseshoe curve back to the east before turning south at the ghost town of Lombard. 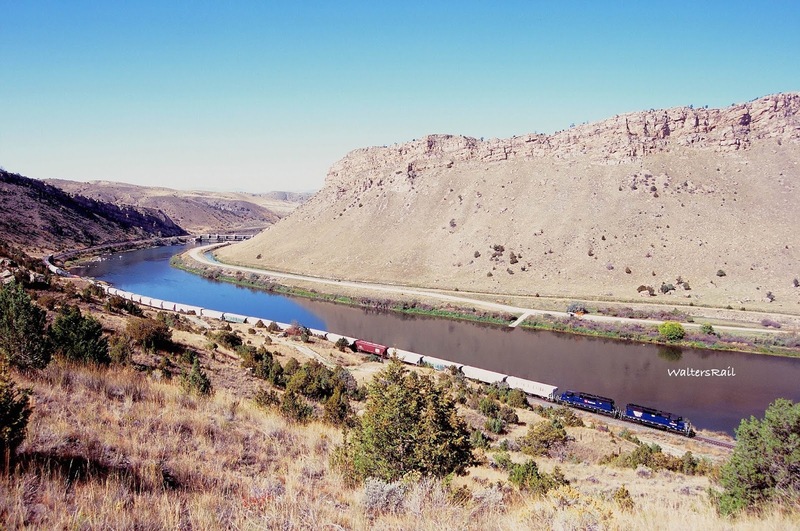 The town was named for the Chief Engineer of the Montana Railroad -- A.G. Lombard -- and was situated at the mouth of Sixteen Mile Creek as it emptied into the Missouri River. 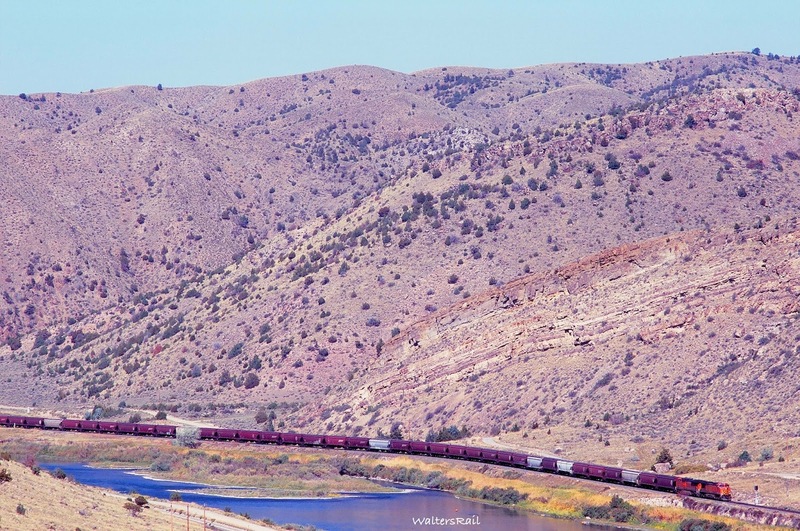 The next four images show the progression of the eastbound M-MISLAU (Missoula-Laurel) around the horseshoe curve in the west canyon. 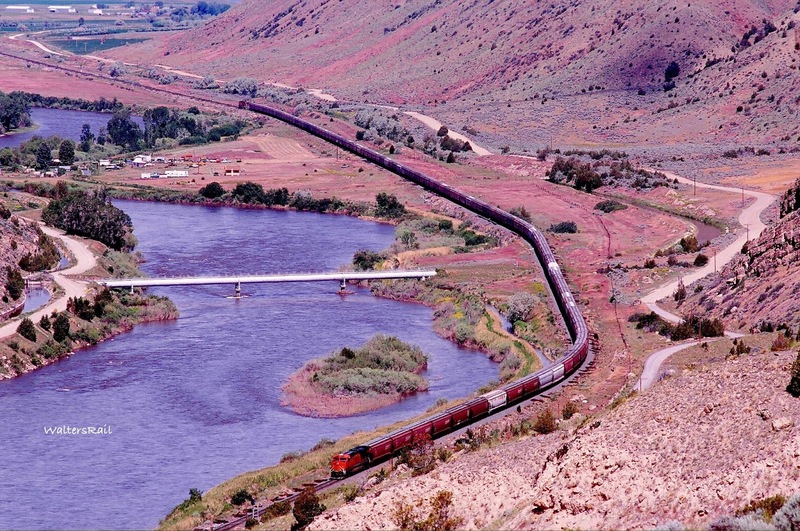 MRL had attached a work train to the front of the consist, accounting for the extra motive power and the caboose! 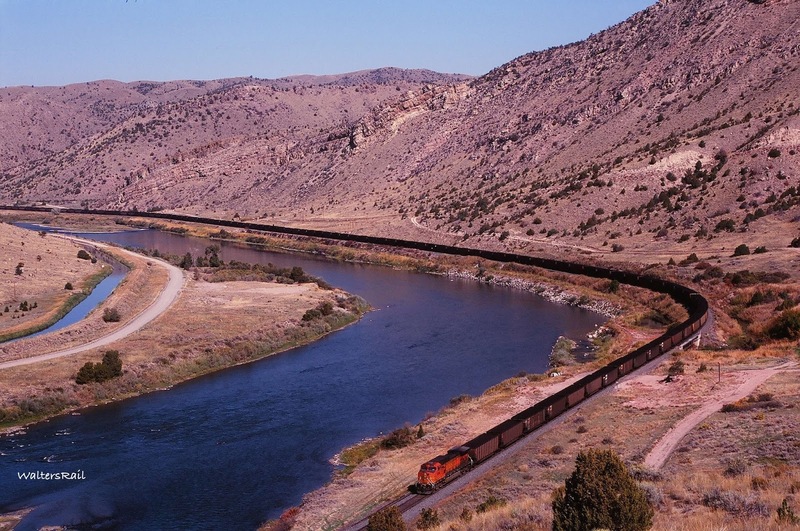 The Montana Railroad was constructed to run from its connection with the Northern Pacific at Lombard about 55 miles to silver mines in the Castle Mountains. 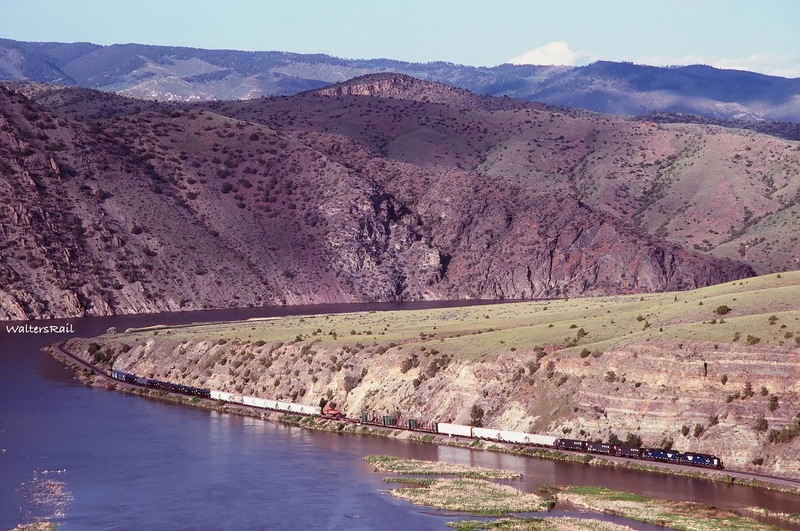 Eventually, the line was extended to Harlowton, named after the railroad's organizer Richard A. Harlow, giving the line a total length of 157 miles. 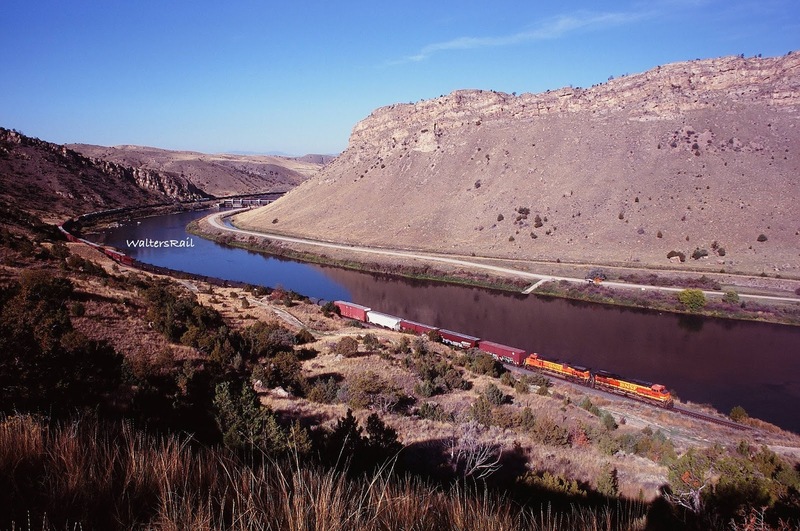 In the early twentieth century, the Montana Railroad was incorporated into the Milwaukee Road as part of its Pacific Extension. In the early days, one could reach Lombard only by train. The first road did not arrive until 1930. At one time the town had a general store, post office, school and hotel. 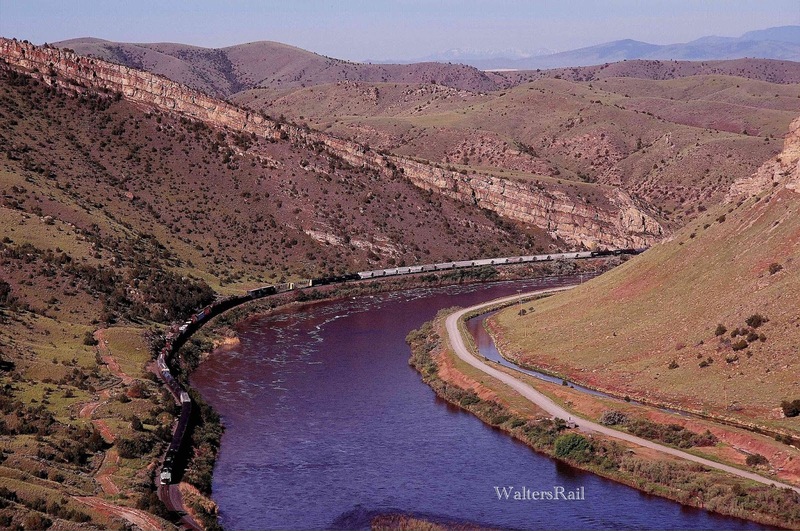 Both the Northern Pacific and Milwaukee Road abandoned their freight agencies and interchange yard in the 1950's. 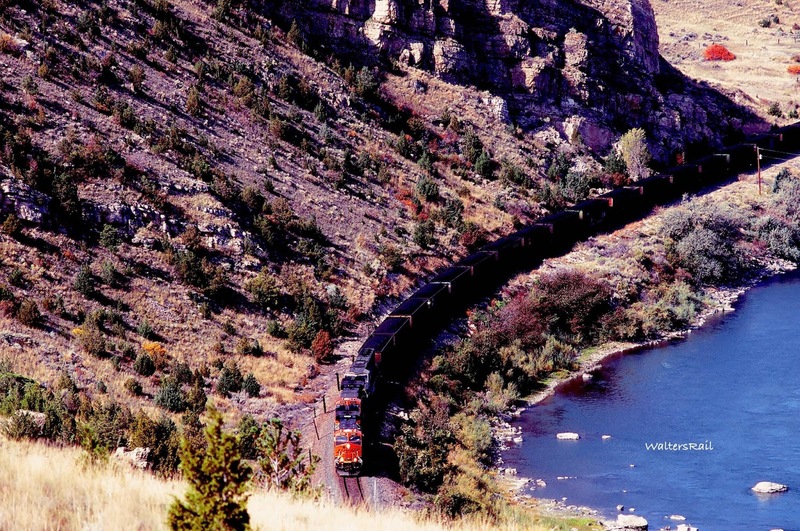 Milwaukee Road abandoned its line through Montana in 1979. Nothing is left today in Lombard except the Milwaukee's bridge across the Missouri River. 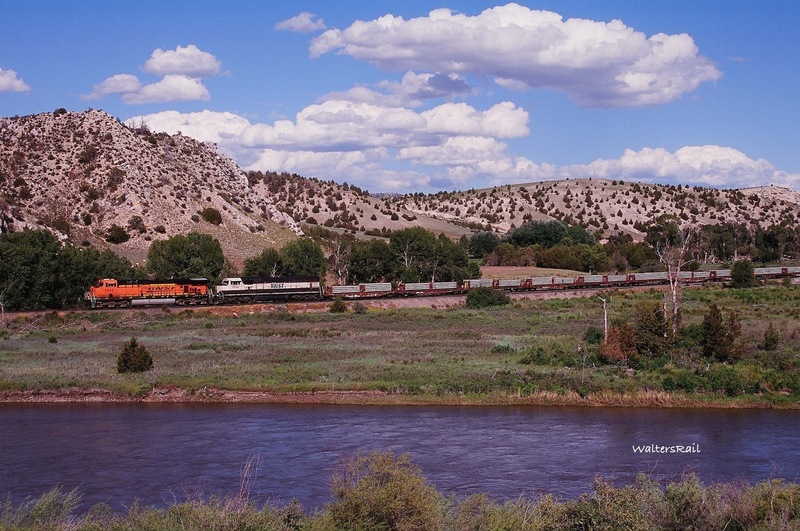 Below is the progression of BNSF H-KCKSPO (Kansas City, Kansas - Spokane) as it heads west through the horseshoe, tracing the reverse path of the M-MISLAU above. 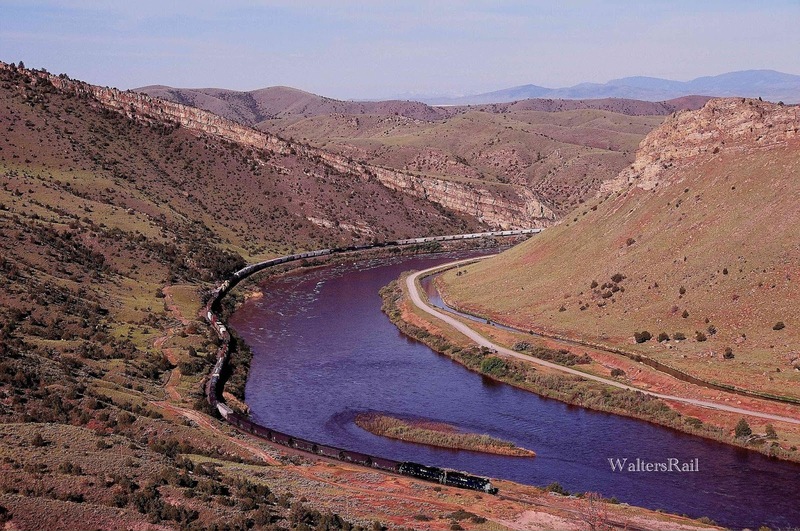 In summertime, the sun sets farther north, and shots of the west canyon must be taken much closer to the bend in the horseshoe, a location where Lombard Siding is not visible. 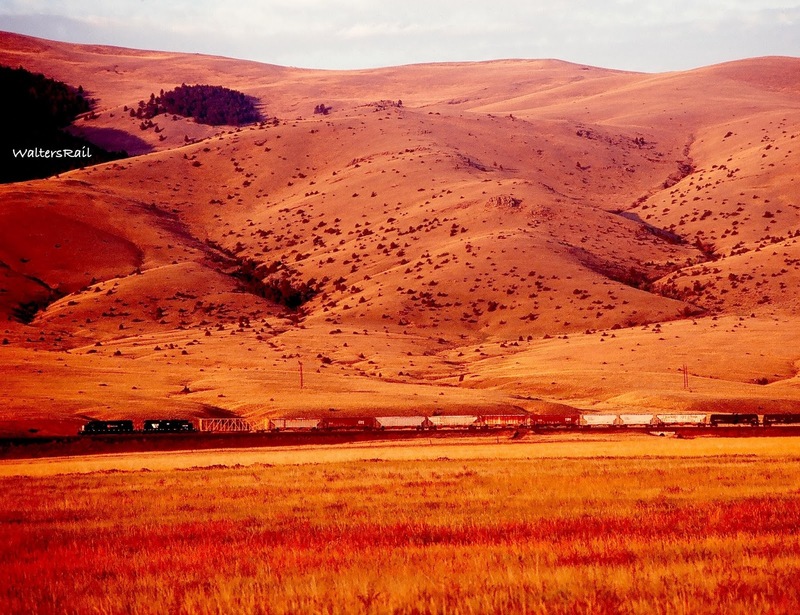 Arriving from more a more southerly latitude, I was startled, the first time I visited Montana in summer, at the length of the days. Since I had traveled before to Europe in summer, I should have been prepared for usable sunlight after 9:00 p.m. Nonetheless, it was enjoyable to eat a leisurely supper underneath clouds, then head back out to the tracks afterwards as the sky cleared. Following are images taken with my friend Art Jacobsen in June 2014. Art was kind enough to show me the way into the west canyon on public roads, and I returned the favor by driving him to the continental divide at Mullan in the fall of that same year, where my rented truck had a flat tire and we spent several hours trying to find the jack and spare and then replacing the tire! I think I got the better end of the deal. 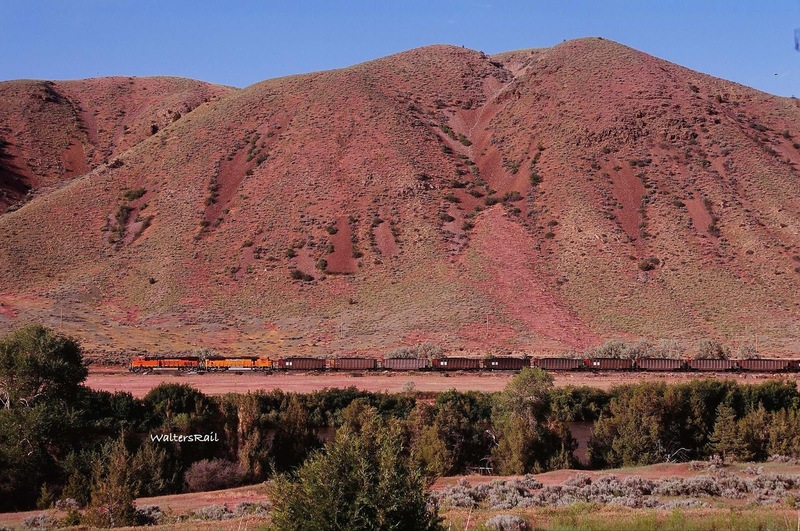 The line through Lombard Canyon today is operated by Montana Rail Link. 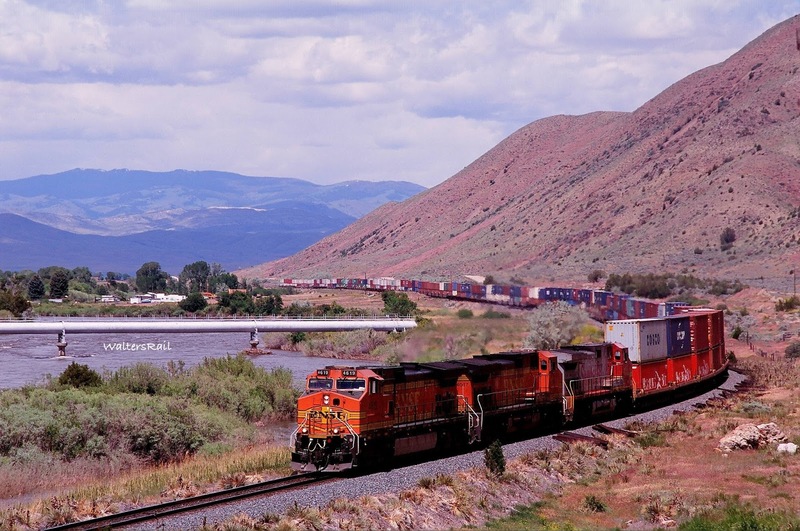 Prior to the MRL, Burlington Northern owned the tracks, and the line was originally constructed and operated by Northern Pacific, first of the three major northwestern railroads to begin construction. 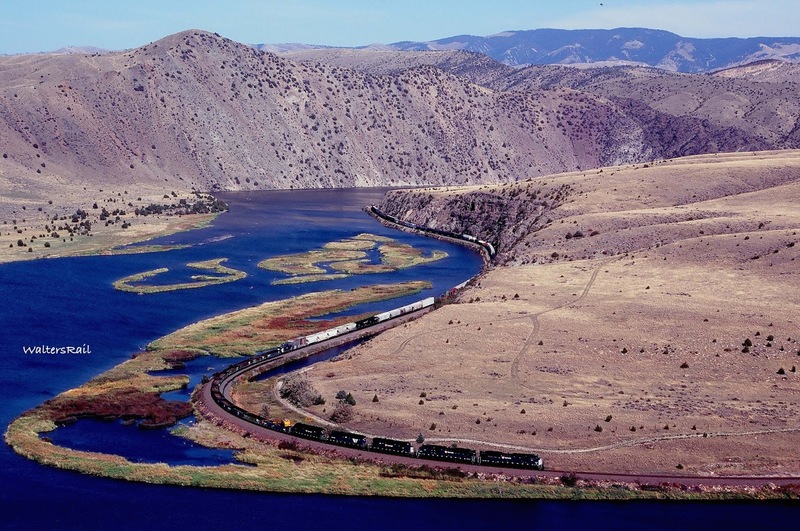 The Northern Pacific was created by Congress in 1863 while still raged the War Between the States, but construction did not commence until 1870, in part due to the War. 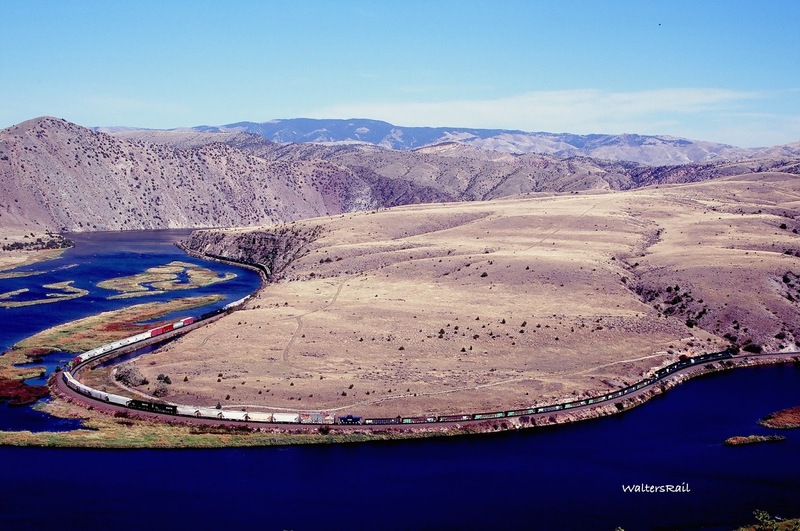 The line roughly followed the route of Lewis and Clark and included some of the most rugged territory ever crossed by a railroad. 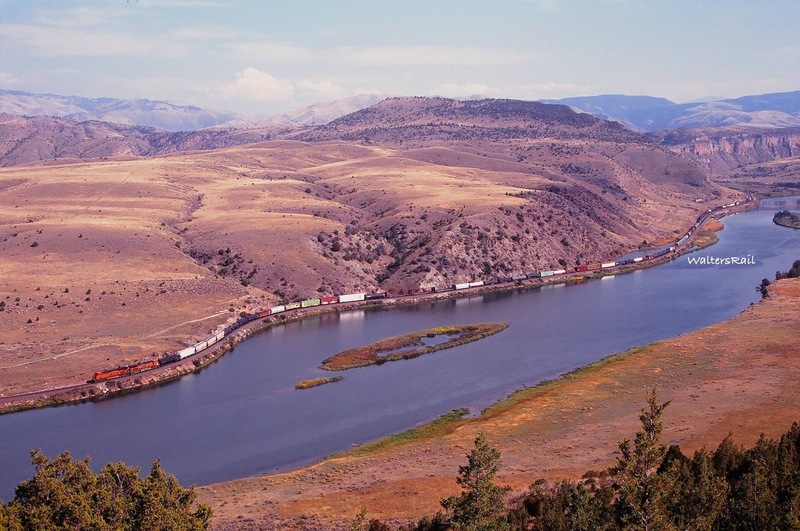 At the time of construction, Montana and Washington were still territories with very few towns or villages. Supplies were shipped in from hundreds of miles. Winter weather, as everyone who has been to Montana knows, was brutal. In 1883, 13-plus years after commencement of construction, the line from Minnesota to Portland was completed -- over 1,800 miles. Given the primitive construction methods of the time, as well as the lack of towns and factories along the way, I continue to be amazed that the line, and others like it, was completed. A comparable construction project in the early 21st century would be, it seems to me, something along the lines of building a bridge from New York to London. If you don't like this analogy, create your own. Just make it really big and really difficult. 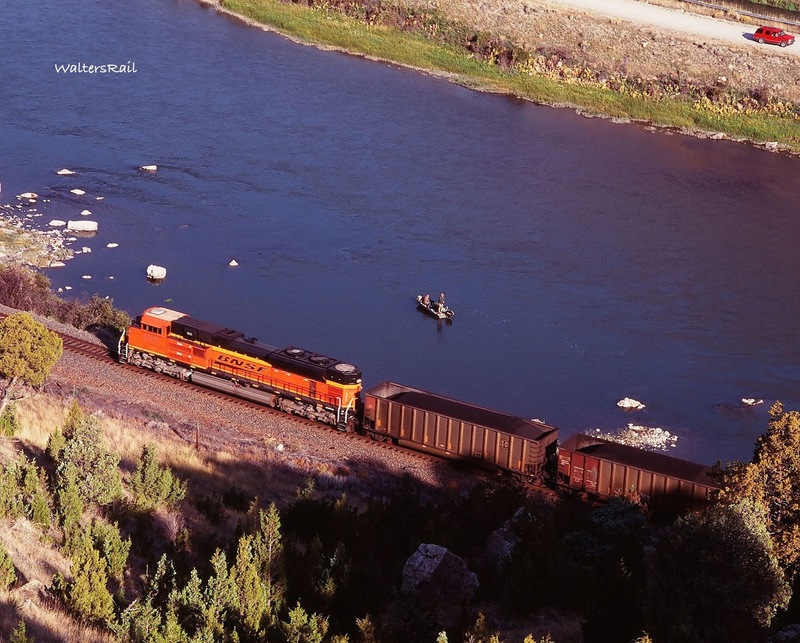 The Northern Pacific maintained its corporate independence until the Interstate Commerce Commission, in 1970, allowed the mega-merger that created Burlington Northern. 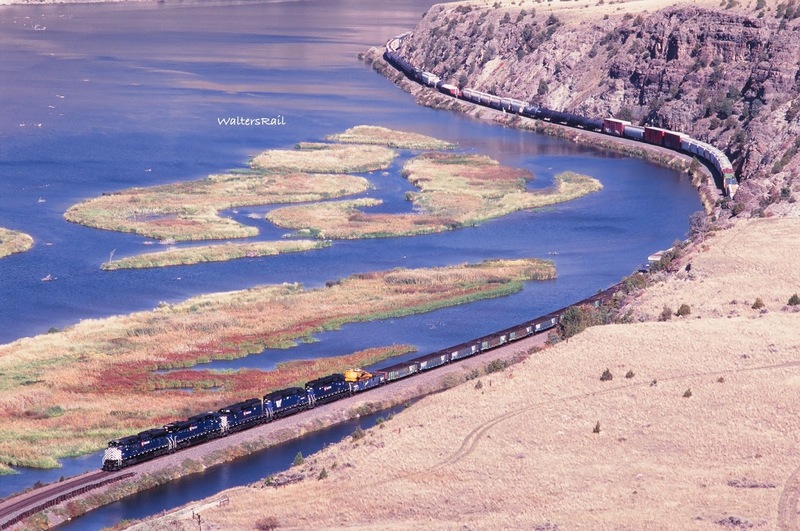 On three previous occasions, the Northern Pacific; Great Northern; Spokane, Portland and Seattle; and Chicago, Burlington and Quincy had attempted to merge. Each time the ICC denied the request. The fourth time was the charm, mostly because all four railroads were going broke, as were many others in the 1960's. 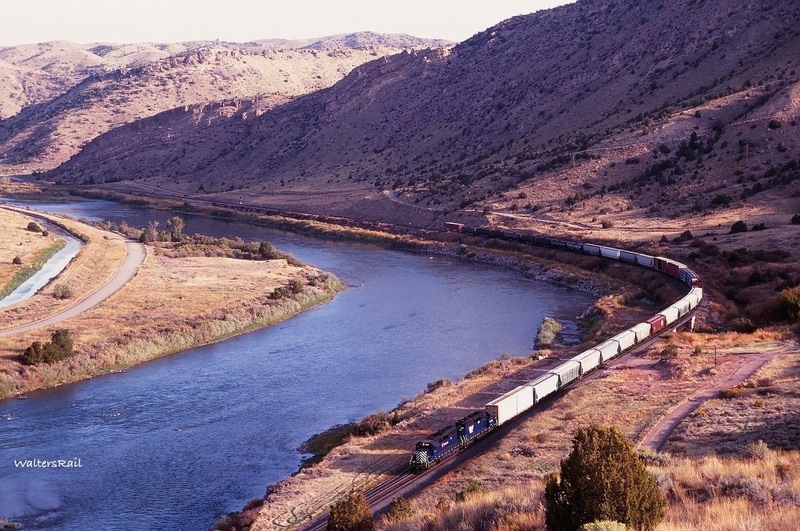 Deregulation of the railroads, championed by the Carter Administration, created the vigorous industry that we know today. But those of us old enough remember the dark times. 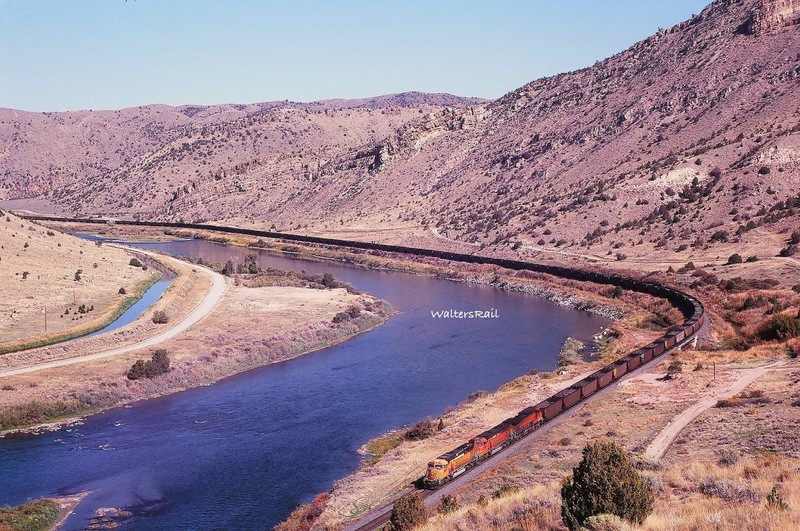 In 1987, the Burlington Northern agreed to lease its southern Montana mainline -- (the old Northern Pacific) from Sandpoint, Idaho, to Huntley, Montana (near Billings) -- to Dennis Washington, a Missoula businessman. At this time, the BN was negotiating a new contract with the United Transportation Union, and the lease was seen by many as anti-union. 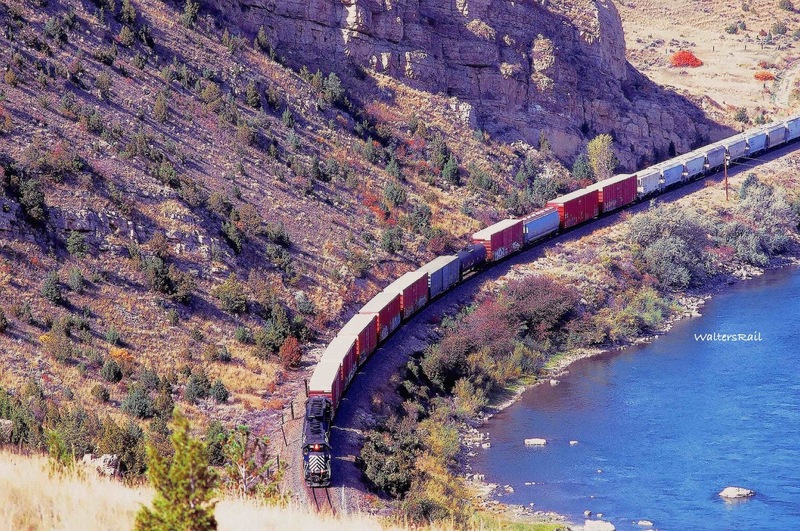 The new railroad, named Montana Rail Link (MRL), reached Billings and Spokane via trackage rights over the BN and thus was totally dependent on BN for access to the world, lending credence to the argument that MRL was nothing more than a way for the corporate giant BN to save money at the expense of the UTU. Employees of MRL, however, are unionized, so the motives of BN may have been slightly more nuanced, to the extent that any large corporation understands what "nuance" means, but cost-cutting was clearly a prime motivation. 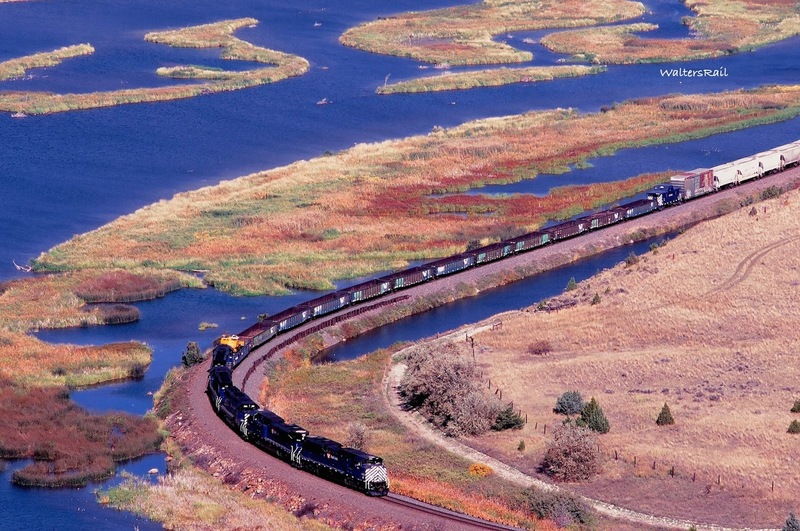 BN retained the old Great Northern "High Line" across northern Montana and probably saw the Northern Pacific as a redundant and unnecessary expense. 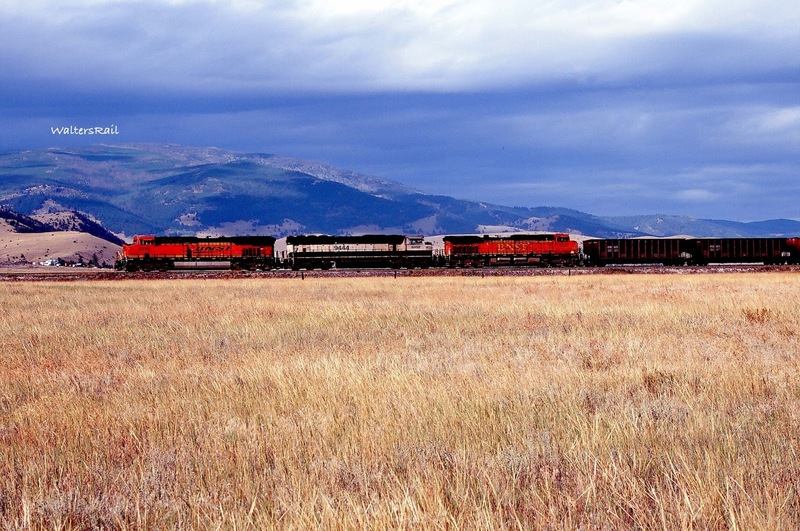 I'm in no position, either morally or from historical study, to pass judgment on the events that created MRL, but I do know that in 2005 the railroad took delivery of 16 new EMD SD70ACe locomotives, the first new motive power ever purchased by MRL. 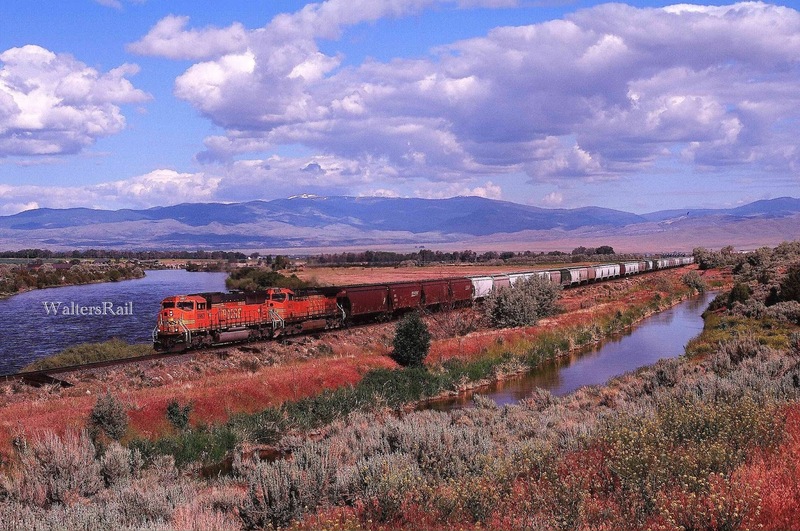 So BN successor BNSF may now rue the day it cut loose the old Northern Pacific through Montana. 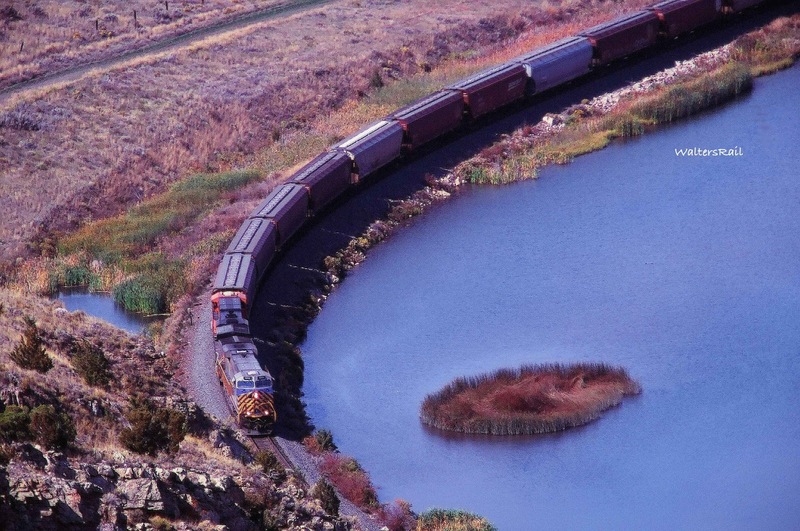 Following are several images of trains with solid MRL power. 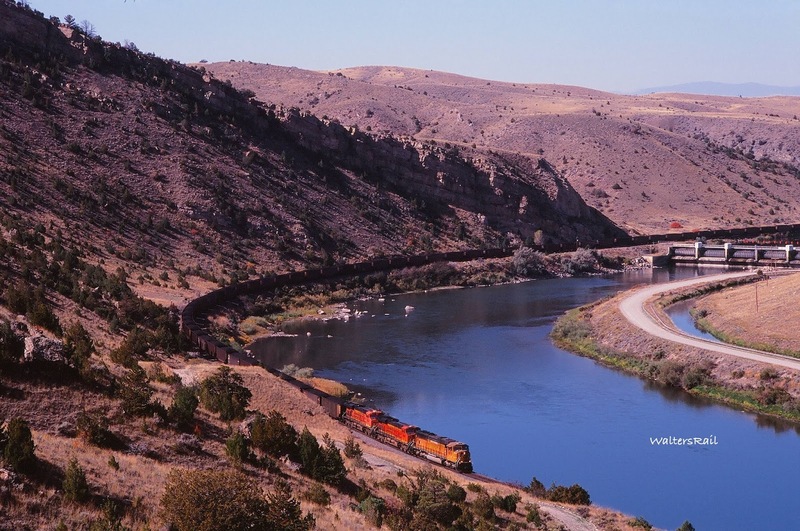 In the summer of 2014, my wife Alexis and I took a trip to Montana, staying a week in a rented cabin near Essex, then another week in a rented house on the Missouri River near the northern mouth of Lombard Canyon. The cabin at Essex had once belonged to the Great Northern and had been occupied by railroad employees. It smelled like insecticide, and the mainline literally ran through the backyard. My wife was not particularly fond of the place. The house along the Missouri River, on the other hand, was beautiful -- arranged and maintained by a woman whose occupation was the hotel business and therefore really knew her stuff. My wife loved it. 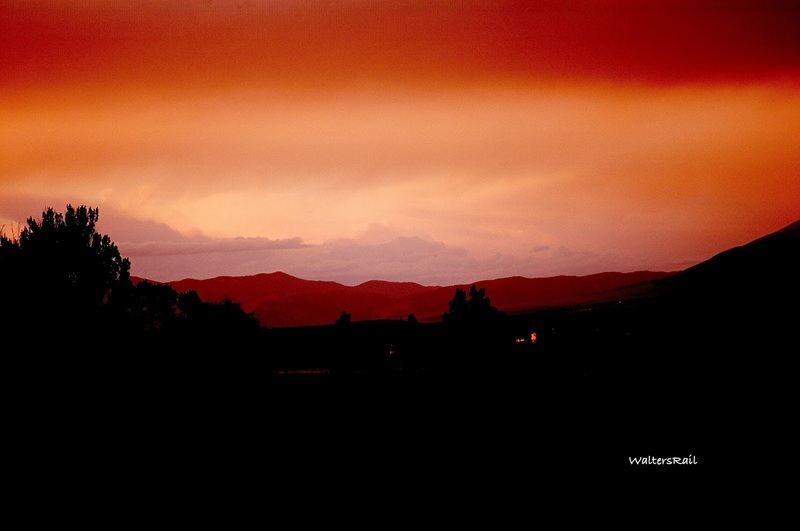 Below is a sunset shot taken from the back porch of the little house -- called "The Hideaway." On our trip we did much hiking and sight-seeing, including mountain trails in Glacier National Park and an excursion to Yellowstone. 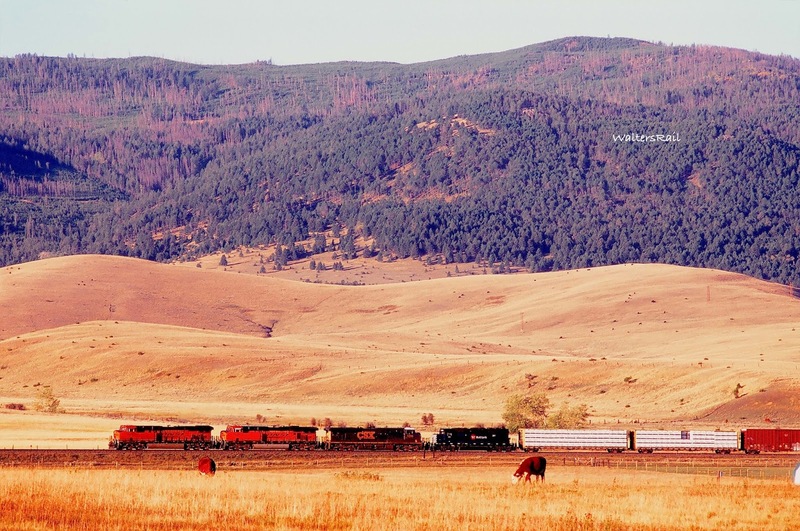 In the mornings, while Alexis drank coffee, I would head to the tracks for an hour or two of photography. I could reach Lombard Canyon in about ten minutes from The Hideaway, when the sun was rising and before clouds began to build. 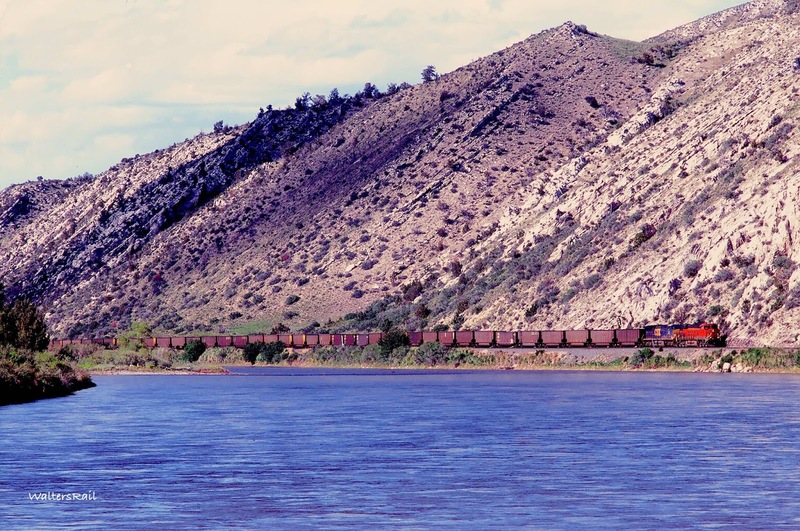 One afternoon my friend Art Jacobsen came to visit, and he took me to a spot along the Missouri River where he claimed he had never taken a photograph before. 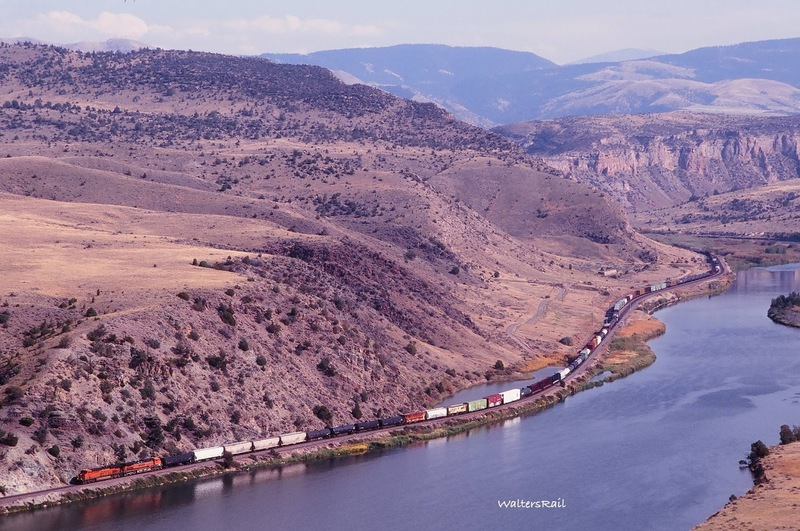 I found that hard to believe, since Art has been photographing railroads in Montana for most of his life, and he is retired now, but I had no reason to doubt him. 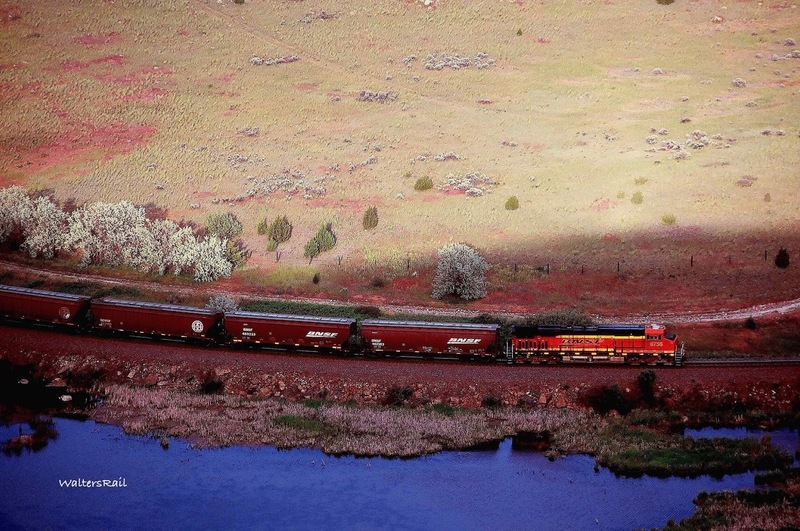 Immediately below is the location and the train we found. "Whilst I viewed those mountains I got a secret pleasure in finding myself so near the head of the heretofore conceived boundless Missouri; but when I reflected on the difficulties which this snowey [sic] barrier would most probably throw in my way to the Pacific Ocean, and the sufferings and hardships of my self and party in them, it in some measure counterbalanced the joy I had felt in the first moments in which I gazed on them." That evening Art and I returned to the Hideaway, where I cooked supper on the grill, and the three of us indulged in adult beverages. 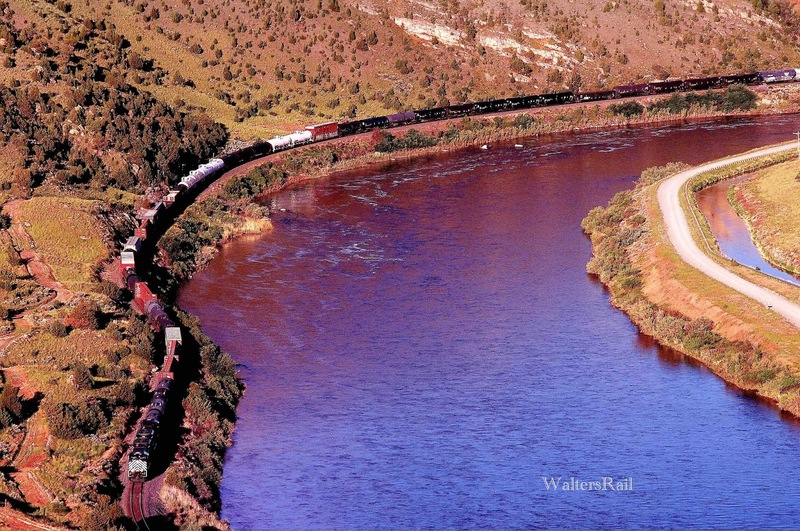 After the meal, I began asking Art questions about the Milwaukee Road, or a "Certain Former Railroad" as Art calls it. My wife and I on a day trip had driven past the Loweth substation, still standing, and I was curious to plumb the depths of Art's knowledge. Art and I called up Google Maps and began looking at the old roadbed, which is still plainly visible from the satellite images. Soon we found Loweth, with Art pointing out various facets of the local geography. 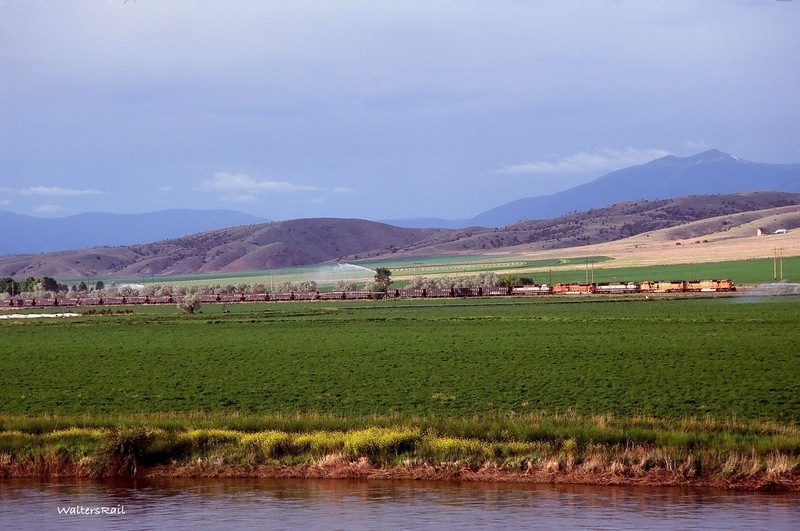 In my mind, I was exploring the country for the first time, like the original surveyors plotting the route of the Montana Railroad. Then we looked at Sixteen Mile Creek, and then we looked for St. Paul Pass. Unbeknownst to me, my wife, who is a CPA and Ph.D. professor of Management at Oklahoma University, and who found our conversation hilarious, was texting bits and pieces of the dialogue back to our son in Oklahoma. Following is a taste of what she wrote. "Dad's friend ate dinner and is still here. They are chatting in detail re the ... pass and the ... grade and the ... zoom in ... there is the loop ... Come up the draw ... See that was removed in 1999 ... Substation 6 at Mason Creek ... And on and on and on and on ..."
My son replied, "Ha! Ha!" My wife continued: "Tunnel 2 ... Right there loops down below ... Whoa! OK! West portal ... There it is down in shadows. Yup, in there. Dad and his friend are just going on and on and on!!!" To this day, I fail to see the humor. 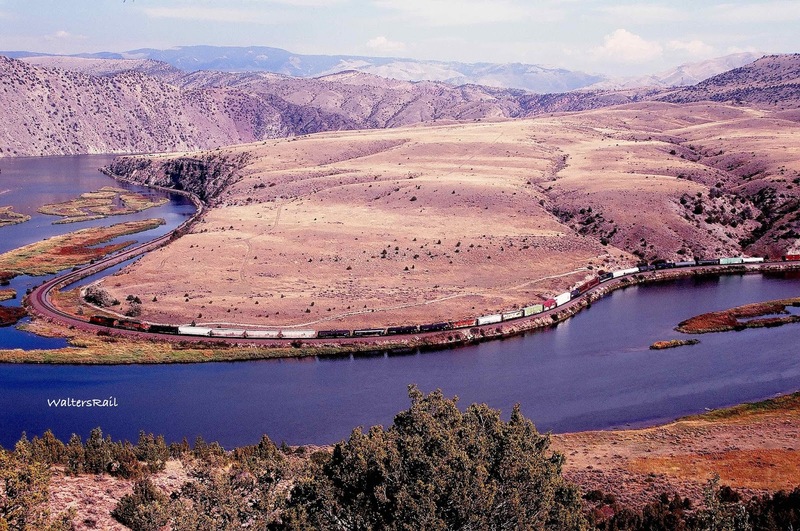 The "Three Rivers" in the title of this post, of course, refer to the Jefferson, Madison and Gallatin, which combine to form the Missouri River not far north of Lombard Canyon. Actually, the Missouri officially starts at the confluence of the Jefferson and Madison Rivers in Missouri Headwaters State Park. 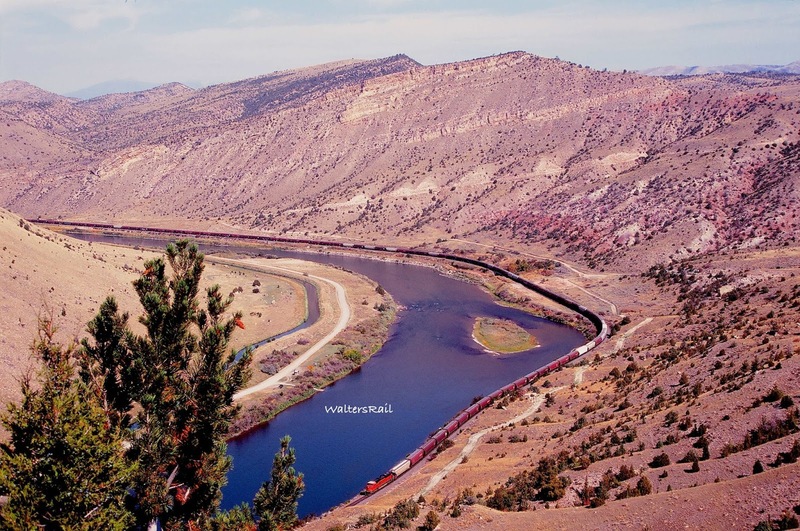 The Gallatin flows into the Missouri a mile downstream. 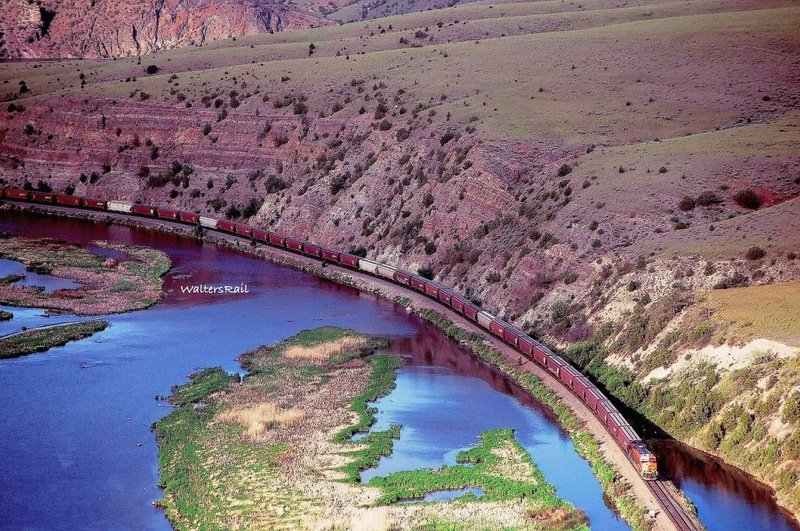 Geographers tell us that the Missouri, at 2341 miles, is the longest river in North America. I, however, believe that the river is longer. Supposedly, the Missouri flows into the Mississippi River north of St. Louis. But I believe it is the other way around. I believe the Mississippi flows into the Missouri. 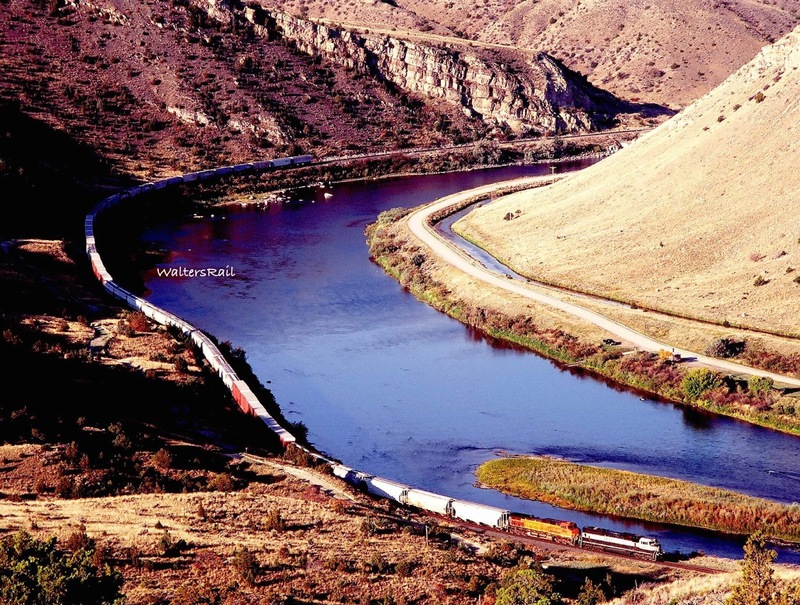 If one takes that point of view, the Missouri River becomes over 3000 miles long -- still shorter than the Amazon and Nile, but formidable nonetheless. Mostly importantly, I have learned not to discuss that Certain Former Railroad around my wife.